We had a blast sponsoring a festive fir for Dover’s Festival of Trees last week. There were carolers, baked goods, raffle prizes, and a host of cheery volunteers. And at the end of it all, 31 beautifully decorated Christmas trees found new homes, and the city raised hundreds of dollars toward decorating Dover for the holidays. 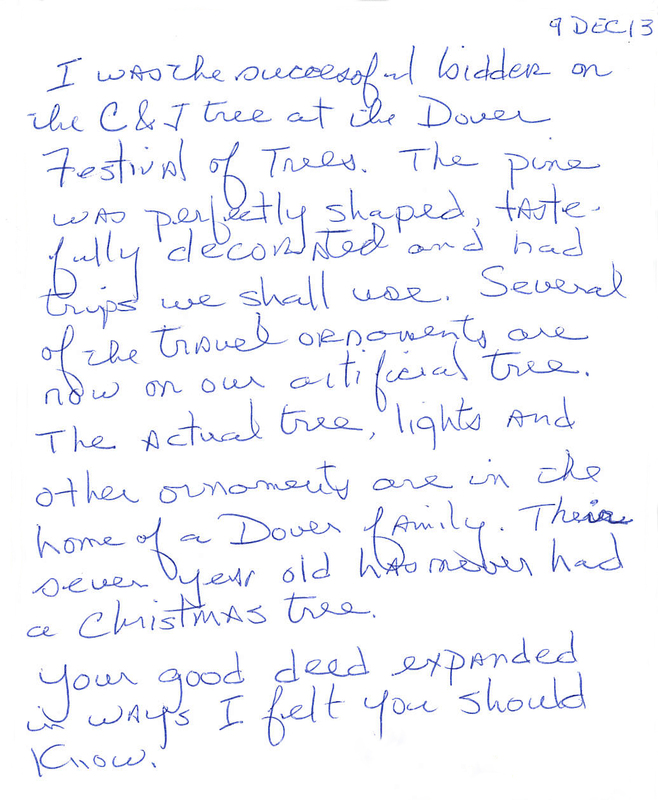 We loved decorating our “Home for the Holidays” tree, and we were touched when we received a handwritten note from the winning bidders. Though they have requested their names be kept private stating, “we do what we do because we feel it is the right thing to do,” we’ve re-posted their message with their permission, below. We’re so happy to learn that, not only will our bidders enjoy a few complimentary trips on us, but that another local family will benefit from their generosity. From all of us at C&J, thank you for reminding us what the holidays are all about!